M16AR - Maretron Fuel Flow Sensor 10-100 LPM (2.64-26.4 GPM) (FFM100 Accessory) - M16AR for only $820.88 ! When fluid passes through the sensor, the internal rotors turn. Magnets which are located in the rotors will pass across sensors in the sensor circuit board. Pulses from these sensors are transmitted to the FFM100 which performs flow rate calculations based on the received pulses. 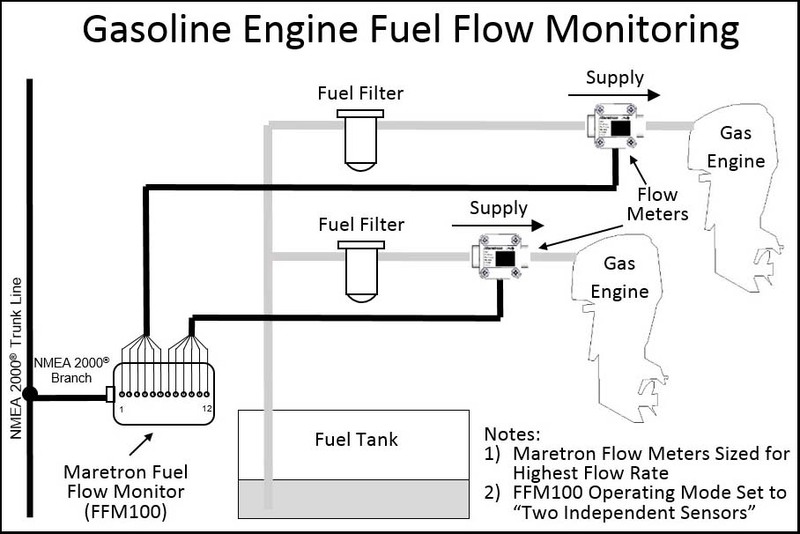 Note: Two Fuel Flow Sensors and one FFM100 Fuel Flow Monitors are required per device being monitored. Note: Two Fuel Flow Sensors (Fuel Flow Meters) required per engine.